In so many applications, some form of glue or adhesive is used to hold a magnet in place. With so many questions about glue, we thought we'd share some of the things we've learned over the years of gluing neodymium magnets. While we're by no means a bunch of adhesive experts like the folks at 3M or Loctite, we've glued our fair share of magnets in various assemblies, projects, products and test rigs. For specific details, be sure to read the instructions on the exact adhesive you're using. We've found that they all seem to start with something along the lines of, "Clean the surface before applying the glue." That can't be stressed enough. The surfaces must be clean. It's amazing how a little bit of greasy fingerprints can reduce the strength and repeatability of a glue bond. You can use isopropyl alcohol with a swab or cloth. There are some products sold as adhesive primers, usually made of alcohol or acetone. They are another way of making sure the surface is clean. Wipe free of dust with oil-free solvent such as acetone or isopropyl alcohol. All epoxies and many other adhesives call for roughening of an especially smooth surface. Use a light grit sandpaper to lightly sand a little bit of the nickel plated surface prior to gluing. After sanding, be sure to clean the dust off the magnet first! For some sizes, you can even just scratch the surface a little with a sharp nail, which works almost as well. Two-Part Epoxy (often sold as 5-minute epoxy in stores) Most epoxies work well, but pay attention to the cure-times. In a majority of applications we see, epoxy works best. It's generally good at bonding with both the nickel plating of our magnets and many other surfaces. 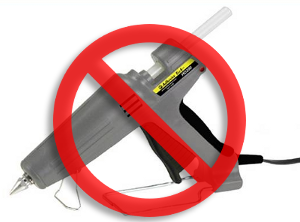 Do not use a hot glue gun on neodymium magnets. While this adhesive works really well on so many surfaces, the high temperatures can demagnetize your magnets. Even the so-called low temperature hot melts are well above the Maximum Operating Temperatures of most neodymium magnets. Don't do it! Trying to adhere magnets to plastics is a sticky issue that quickly gets complicated. Again, we're not adhesive experts, so consider contacting technical support at an adhesive company for your specific needs. Some plastics are easier than others to glue to. Plastics like ABS (used in many consumer products) and PVC (the white plumbing pipes) work well with many different adhesives. Other plastics like Polypropylene (milk jugs) or Polyethylene (plastic shopping bags) are practically impossible to get a strong bond with. For some, you will have to resort to a mechanical bond. For smaller magnets, double-sided adhesive tape can be a good fit. Such tapes are generally not strong enough for the really big, powerful magnets. Such options might include 3M's VHB Tape, or our own Adhesive Dots, which are pre-cut for a number of disc sizes. Glue and magnets is such a hot topic, we've received a number of great suggestions from our customers. Thanks to all who have shared their experiences! One of our customers wrote in about good results with a high peel strength Double/Bubble Orange epoxy adhesive. They have a neat package that's a one-time-use envelope. Another reported good success holding cylindrical and ring magnets into holes in an anodized aluminum part using Loctite 609 (acrylic adhesive) and Loctite 638 (urethane methacrylate). When used with Loctite 7649 primer (an acetone cleaner), they didn't find it necessary to roughen either surface. A number of folks wrote in to warn about using JB Weld adhesive with powerful neodymium magnets. JB Weld is a popular epoxy adhesive with steel filler material. Apparently, the flakes of metal help to draw the material all around the entire magnet while the glue is still wet, making an awful mess. While there might be a few applications where this phenomenon is a feature, be cautious for general use. Thanks to everyone who wrote in! Also note that, if controlled, some folks also reported great bond strength using JB Weld. For gluing to plastics, a customer strongly recommend checking out Loctite Plastic Bonder Epoxy. It's an epoxy formula with acrylic in it. They reported great results with Polycarbonate (PC), without having to roughen either surface! Loctite says it works well with, "ABS, PVC, Acrylic, Nylon, Polycarbonate and Mylar." Avoid gluing magnets to plastics with 3M thin transfer tape. This is due to the surface flatness of the magnet vs the plastic can cause areas of poor contact so the adhesive doesn’t "wet out." Don't let the freshly assembled product cure near steel products or other assemblies that might pull the magnet away while the adhesive dries. 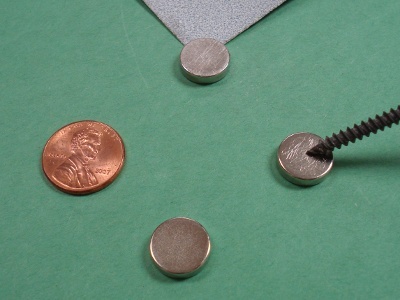 Instead, try arranging magnets so that they pull towards a steel plate so that it holds the magnet in position! 3M foam tape with Low Surface Energy (LSE) adhesive on both sides works will with magnets and ABS plastic. The foam gives enough to "wet out" both surfaces.